I knit some socks! I'm immensely proud of these. Not only did I make a PAIR (yes TWO socks) but I also managed to make an "extra spicy" pattern with a nonstandard construction. 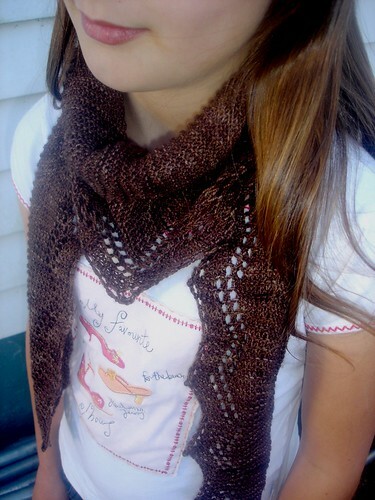 These are the double heelix pattern by Jeny Staiman from the Deep Fall 2011 knitty. When I first saw the pattern I thought they were very cool, but way too difficult for a not very experienced sock knitter like myself. Then the other week at my knitting group the shop had a big box of knitsch yarns just begging for me to have a look through. When I saw the purple (colourway - supernova) and the yellow (yellow brick road) together I was reminded of the socks one of my Ravelry friends made: thegoodwitch made hers in yellow + mulberry and that was that. The colours are bright and bold and a lot braver than I normally choose but they look so great, I think I'll have to try and step outside my colour comfort zone more often. I intended to stash these for awhile while I finished off some more urgent things but... you know how it happens. The socks are knit heel out. You start my working a Judy's Magic Cast on and then cleverly work a spiral by switching colours and working JMCO increases at the edges. It's reasonably complicated and I suggest doing this step when the children are in bed. There is an accompanying video to help you cast on and get through the first couple of cycles though. Once the heel is complete there is a PCO and then very easy knitting for the foot and cuff. They are like the perfect combination of learning something new/concentrating hard and then easy peasy knitting. A thoroughly enjoyable knit (which should be obvious from the lack of second sock syndrome)! I've some other Knitsch (New Zealand hand dyed merino sock yarn) colours stashed but this is my first time knitting it. I love the brightness of the colours and the lovely even dye job. Its a tightly plied merino so does have a tendency to wind back on itself which is not so helpful when you are working with 4 live strands but other than that the yarn was a lovely knit. In 50g skeins it is also a perfect choice for this pattern. DH says they are my "southland" socks but I don't listen to him - to me, they're my "I'm going to knit that pattern again one day" socks! I'm on a bit of a steampunk binge at the moment. 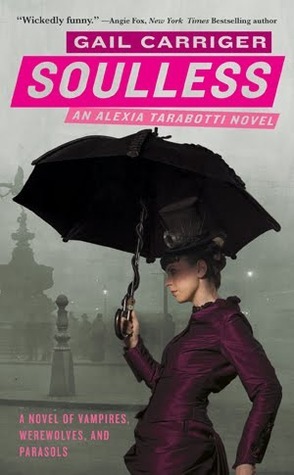 During August I read the Parasol Protectorate series by Gail Carriger. So far there are 4 books - with another due for release in early 2012. The series is described as: "comedies of manners set in Victorian London: full of vampires, dirigibles, and tea. They are Jane Austen doing urban fantasy meets PG Wodehouse doing steampunk." They are hilarious. Funny and light with truly witty dialogue. The main character Alexia Tarrabotti is a woman facing some serious problems - she is without a husband, her social standing is affected by her wayward Italian father, and she is soulless, a secret she must keep from her family and friends. When she accidentally kills a vampire, Queen Victoria sends her trusted advisor, Lord Maccon (werewolf and rather charming alpha male), to investigate. And that's when things get interesting. I will admit to finding the first third of the first book a bit pedestrian, but once I got further along, I couldn't put it down and read all four books in about a week. I am not normally a fan of the Victorian era but find myself captivated by steampunk at the moment - the retro-futuristic (isn't that a great term?) alternate histories are just so fascinating. The steampunk-ness of these books is on the light end of the spectrum, as is the explicitness of the romance scenes. It's all very light and fun - the sort of the books you could enjoy for some no-thinking required summer reading. 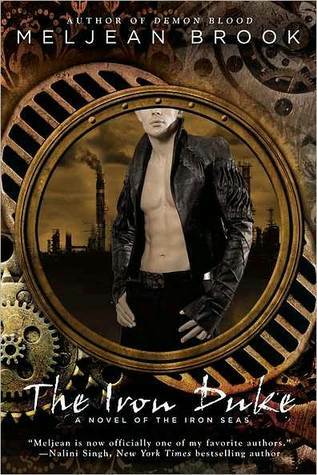 The Iron Duke by Meljean Brook is also steampunk. It's not witty or light or frivolous like the parasol books. There is also no paranormal - just a sinister, dark alternate history of Britain where the people have been secretly infected by nanoagent automatons. "The Horde" rules over most of the world with their radio based technology which allows them to control the masses via the machines they have infected them with. It's pretty grim, and the author does a great job of creating a dark and smoke ridden London with the most unpleasant of histories. The Iron Duke - enigma, a pirate turned local hero who was successful in liberating the country from Horde rule, and Mina, a woman struggling against gender and class discrimination team up to solve a crime that threatens to affect the lives of everyone in Britain. The book has plenty of action, lots of steampunkish automatons and a definitely unique alternative universe. I cared less for the "love"storyline which has some questionable aspects, but overall a wonderfully sinister steampunk novel. At the moment I am reading, yes another steampunk novel, The Alchemy of Stone by Ekaterina Sedia. This one is different again - the main character, Mattie, is an intelligent automaton. Literally a clockwork girl who has trained as an alchemist and who is about to get caught up in conflict between the Mechanics (including Mattie's creator), the Alchemists and the mysterious gargoyles. 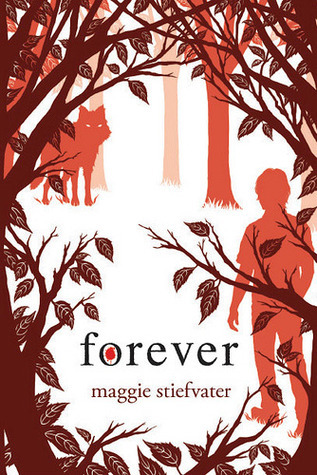 The writing is superb, and the atmosphere is almost fairytale-like. So far, a lovely haunting read. If you've got any steampunk recommendations for me I'd love to hear them! Today is the one year anniversary since a 7.1 earthquake rocked Canterbury out of the blue. Wellington is the earthquake risk in New Zealand - not Christchurch - the quake was met with disbelief and shock that it happened on the Canterbury Plains. When the September quake happened DH was away in Queenstown and I was home alone with our 3 kids. I remember waking up thinking a truck was driving through the house - so much noise (the roaring of the quake itself but also breaking glass and the sound of the bookcase outside my room toppling over) and of course violent rocking. It took me a few moments to realise what it was! The power went out instantly and I spent the next few minutes trying to find a torch, calming our 2 smallest children, trying to get all of my books that had been thrown all over the hallway off the heater before they caught on fire, making sure our daughter at the other end of the house got to me safely - while the house was rocked by more aftershocks. It seems like another lifetime ago when I think about how unprepared we were. We thought we were so lucky. Months passed and the after shocks subsided. No one was killed and it even got to the point where they were publishing books full of photographs and stories - a testament to how well we did, how fortunate we were. Then February 22 happened. It was a smaller quake, but shallower, closer to the city. It killed over 180 people, made hundreds homeless, wrecked havoc on homes, businesses, infrastructure...families. It seems we weren't so lucky after all. Today Christchurch is still rebuilding. It isn't "over" even though it may not make the news on a daily basis anymore. People are still living in limbo while they wait to find out if their homes can be fixed, they still live with daily shakes - 8500+ since September - and the fear and worry that goes with that. The red zone is still closed to the public - pretty much the entire central business district - while demolition work continues. Entire suburbs have been declared 'red' also - owners have to leave their homes and move away. It's hard to believe 12 months have passed since that first event. How much has changed for all of us affected since then. Today my thoughts were with everyone living in Canterbury. 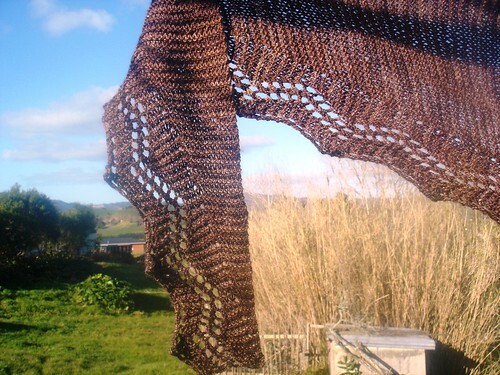 And in remembrance of friends and family living in Christchurch, today I released my very first pay pattern: Faultline. 25% of proceeds (for the forseeable future) will be donated to the Red Cross NZ in recognition of aid they have provided to families (including mine) over the past 12 months. Faultline combines all my favourite elements in a shawl :- squishy garter stitch, knit sideways, a shallow shawlette shape that wraps enough so you can wear it as a scarf, and an easy to memorize lace. It is also fully reversible for maximum versatility. I knit my sample in Fibre Alive Merino Mania which you can buy online from www.joyofyarn.co.nz This is my favourite NZ yarn at the moment and James the owner generously offered yarn support for a couple of my test knitters. At just 320m/100g it also means this is a very quick knit but one that is perfect for showing off those special hand-dyed yarns. I had a fabulous team of testers. I really wanted this ready to go in time for today, and they all did a stellar job getting their samples knitted and feedback to me. I appreciate their help very much - so many many thanks to Jill, knitapotamus, Knittemptress, Khai, Helen, Jackie and Sam. 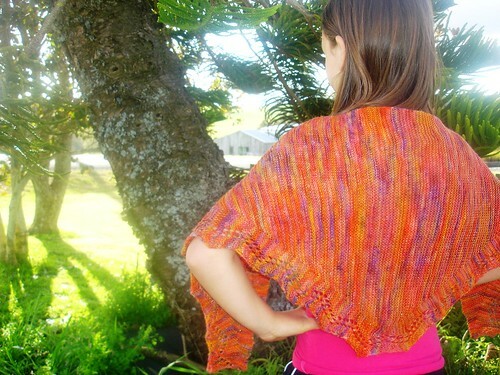 The pattern includes instructions for a shawlette, but also how to adapt it as a scarf and a triangle shawl. 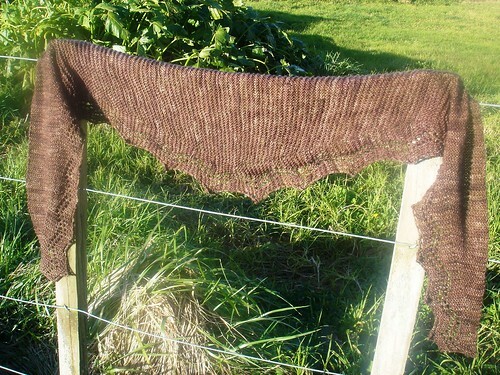 I knit a shawl sample using some gorgeous autumn coloured gold sparkle sock yarn from Tri'Coterie. A special thank you to Maylin for the yarn, for her encouragement and support, and for knitting her own sample of the pattern. 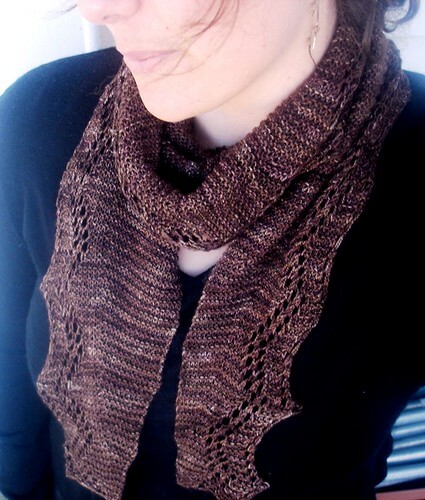 Faultline costs $4US and is available as a Ravelry download.